What did you put first today that made you feel especially good? 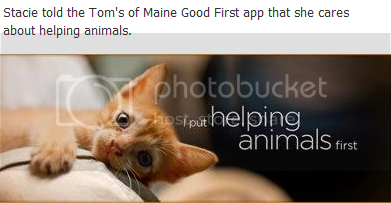 Here's my answer to this important question from Tom's of Maine on Facebook: I put helping animals first. So when I was checking the Tom’s of Maine Good First application on Facebook and saw the five choices, it was a no-brainer which one applied to me. I even shared it on my personal profile so my friends could see my selection. 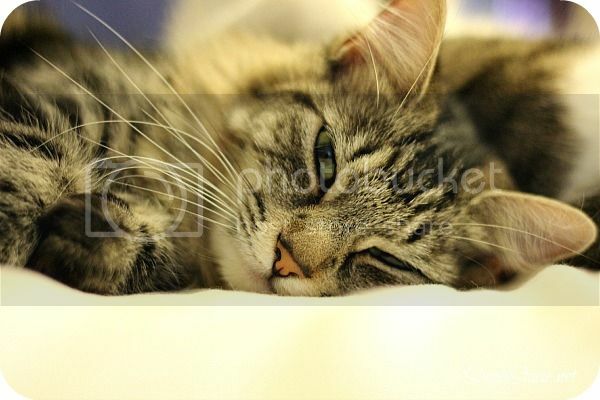 My friends know I love my animals and I often share pictures with them of my furbabies. I had a few of them "like" my post and one even shared it. I also enjoyed seeing which Facebook friends share the same passion for helping animals as me! After make your selection, the application shows you pictures of your Facebook friends who picked the same option as you. I now know who my fellow animal lovers are. Very cool! I encourage you to check out the Tom's of Maine Good First Facebook application and make your selection about what made you feel good today. Please leave me a comment and tell me the good things you do to make a difference each day. I'd love to hear from you!